~500 copies per issue, of which ~350 issues were distributed free of charge. Each issue cost approximately $25 to print and distribute, according to an August 26, 1937 letter from Gorham B. Munson to Charles Allen. Prices for no. 7 – 8 is not available. In late 1921 Secession founder Gorham B. Munson met Matthew Josephson at a Paris cafe. Both were American expatriates in their mid-twenties, drawn to the bohemian scene in Paris as well as its growing experimentalism in art, including Cubism, Dadaism, Futurism, and Surrealism. 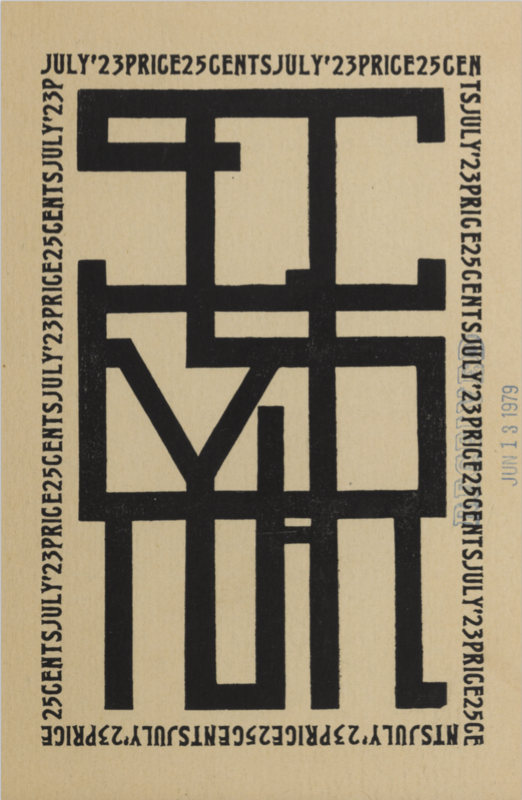 Drawing on these various movements, Munson and Josephson wanted to create a little magazine that would connect and promote European avant-garde literature to select American audiences. They were also partly responding to Malcolm Cowley’s call, as published as “The Youngest Generation” in the October 18, 1921 issue of the New York Evening Post, to bring together certain young, rebellious writers into a single magazine. In a dingy hotel room in Vienna on August 1922, Munson edited and published the first issue of Secession with a budget of 20 U.S. dollars. Munson was in charge of editing the magazine under the title of “Director”; Josephson was in charge of scouting potential contributors. They intended for the magazine to run for only two years, from 1922 to 1924, because “[b]eyond a two year span, observation shows, the vitality of most reviews is lowered and their contribution, accomplished, becomes repetitious and unnecessary. Secession will take care to avoid moribundity” (1). The editorial office changed locations during the magazine’s two year run, and such locations included Vienna, Berlin, Reutte, Florence, and then finally, New York. After Munson left for the United States, Josephson became editor of the third issue. He included his own story, “Peep-Peep-Parish,” in the issue after Munson had rejected it, and this marked the beginning of conflict between the two men. Kenneth Burke was listed as co-editor starting with the fourth issue of the magazine to settle disagreements between Munson and Josephson with a vote. This plan, however, was foiled when Josephson disregarded Burke’s and Munson’s votes and reduced a 100-line Richard Ashton poem to 3 lines in Secession‘s fourth issue. It was also around this time that Josephson took an editorial job at Broom, another European little magazine and Secession’s rival. The conflict became bitter when Munson accused Josephson of sabotaging the printing of the fifth issue of the magazine; he claimed that Josephson had gotten the publisher, John Brooks Wheelwright, drunk in a cafe near Paris and convinced him to include a haphazard, damaged poem, “Faustus and Helen” by Hart Crane, into the pages. The conflict reached an all-time high in late 1923, as Munson and Josephson engaged in a physical and verbal brawl on the muddy grounds of Woodstock, New York. During the Woodstock brawl until Secession’s eighth and final issue, Munson and the magazine were experiencing financial difficulties. Munson quietly published the last issue of Secession in New York City, which featured only an essay by Ivor Winters. The aim of the magazines – and the general aims of its various, and at times competing editors – were to print work, reviews, and criticisms of contemporary and experimental works that Munson and Josephson believed “would ordinarily experience a great difficulty in finding a hearing among the established periodicals of America and Europe” (3). Despite its limited 500 print circulation, Secession reached and stirred controversy with a select American audience: every number was reviewed and criticized in other periodicals, including The Nation, The Dial, The Double Dealer, The Little Review, The Nation and Athenaeum, The New York Times, and T.S. Eliot’s Criterion. “There is emphatically something from which to secede: the American literary milieu of the past decade, a milieu which believed that literature was social dynamics and that its social significances were paramount. There are, in addition, bitter necessities inherent in this milieu which demand secession. One of them is precisely the lack of opportunity for development by others which the valuable work of Brooks and Mencken exemplifies. And there is, at least, a small group of writers able by reason of the different direction of their work to organize a secession. “For secession is not a revolt. It is rather a resignation from a milieu whose objects are other than ours. It is an unemotional sloughing-off by writers who profit by the gains of that milieu, but have never been bound to it. It is, in essence, a prompt deviation into immediate esthetic concerns. Our warfare is not denying, but tangential” (4). “‘Secession’ exists for those writers who are preoccupied with researches for new forms. It hopes that there is ready for it an American public which has advanced beyond the fiction and poetry of Sinclair Lewis and Sherwood Anderson and the criticism of Paul Rosenfeld and Louis Untermeyer. Shortly after his graduation from Wesleyan University in Connecticut, Gorham Bockhaven Munson became involved with the Greenwich Village scene of avant-garde writers in the late 1910s, where he developed his ideas on contemporary literature. He later settled in Paris, where he met colleague – and eventually bitter rival – Matthew Josephson. Both were co-founders of the magazine, first published in Vienna. Differences between Munson and Josephson contributed to Josephson’s departure the more widely circulating Broom. After the closing of Secession in 1924, Munson was also assistant editor of s4N, another transatlantic little magazine devoted to experimental literature. Munson’s works also appeared in The Atlantic Monthly, The Saturday Review, and Yale Review. He spent his remaining years in New York as an academic and professor at The New School, a private university located in Greenwich Village. Munson passed away in Hartford, Connecticut on August 15, 1969. Josephson’s varied interests ranged from poetry to nineteenth-century French literature to twentieth-century American economics. Josephson was also the associate editor of another little magazine, Broom, during the same years as Secession. He resigned as director and contributor to Secession after the fourth issue due to managerial and literary differences, as claimed by Munson in Issue 7. These differences culminated in a physical and verbal brawl between Munson and Josephson in late 1923 in Woodstock, New York. Munson saw Josephson’s departure to Broom as evidence of being “an intellectual fakir” and an opportunist. After Broom‘s closing in 1924 due to financial difficulties, Josephson took a position on Wall Street which sparked his interest in American capitalism, as evidenced in his 1934 publication of The Robber Barons, a probing look into the post-Civil War rise of great American capitalist giants, including Carnegie, Morgan, Rockefeller, and Vanderbilt. He is credited with coining the term “robber baron.” Josephson was also the editor of transition, a quarterly little magazine that featured Expressionist, Surrealist, and Dadaist works. In his late years Josephson was a renowned biographer, publishing works on Emilie Zola and Jean-Jacques Rosseau. He passed away on March 13, 1978 in Santa Cruz, California. After dropping out of Ohio University and later Columbia University, Kenneth Burke met Gorham B. Munson in the late 1910s, at the height of the Greenwich Village avant-garde scene. His friendship with both Munson and Josephson resulted in his co-editorship of Secession in 1923. After the closing of Secession, Burke worked for The Dial as an editor in 1923 and later as the music critic from 1927 – 1929. He was also the music critic for The Nation from 1934 – 1936, and he was awarded the Guggenheim Fellowship in 1935. Burke is perhaps most well-known as a literary theorist, developing ideas on “dramatism,” “the dramatistic pentad,” and “the Terministic screen.” His principal work is a collection of essays known as Language as Symbolic Action, published in 1966, in which he fleshed out his ideas regarding the “definition of man,” which, according to Burke, is a symbol for animal, and that man interprets reality through a set of symbols. He was awarded the National Medal for Literature at the American Book Awards in 1981. Burke passed away on November 19, 1993 in Andover, New Jersey. Brooker, Peter and Andrew Thacker, eds. The Oxford Critical and Cultural History of Modernist Magazines: Volume 1, Britain and Ireland 1880-1955. New York: Oxford University Press, 2009. Print. –––. and Andrew Thacker, eds. The Oxford Critical and Cultural History of Modernist Magazines: Volume 2, North America 1894-1960. New York: Oxford University Press, 2012. Print. Hoffman, Frederick J., Charles Allen, and Carolyn F. Ulrich, eds. The Little Magazine: A History and a Bibliography. Princeton, NJ: Princeton UP, 1947. Print. Images. “Secession.” Blue Mountain Project: Historic Avant-Garde Periodicals for Digital Research. Princeton University. Secession. 1922-1924. Princeton University Library: Blue Mountain Project: Historic Avant-Garde Periodicals for Digital Research. Web. Secession, 1922-24 (dir. Gorham B. Munson). Jacket2 Philadelphia, PA (August 31, 2011). Web.